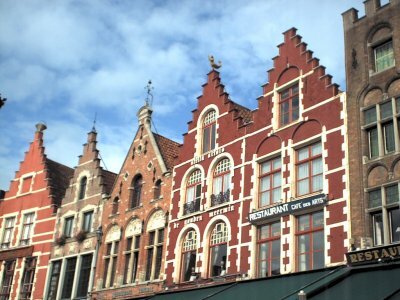 The Historic Centre of Brugge represents a medieval town built in mostly brick Gothic, which also has been the birthplace of the Flemish Primitives painting school. 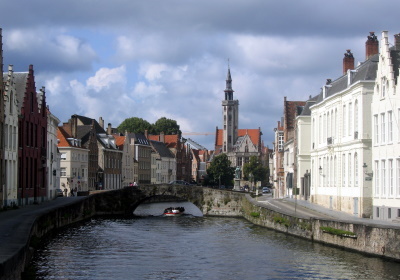 From the 13th century onwards, Brugge became an international trading center. The produce of cloth and the role of Hansean wharehouse brought the city its wealth. The heydays resulted in the construction of numerous Gothic buildings and churches. Also, the Flemish Primitive painting school could flourish here. Notable artists from here include Jan van Eyck and Hans Memling. 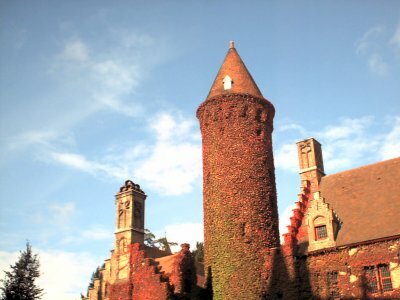 Already in the 16th century, Brugge's wealth had vanished. But this sorry state is the main reason that the whole town has preserved its medieval character so well. On a sunny Saturday I drove to the town of Bruges, about 2 hours from my home. My preparations (websites and a travel guide) left me with high expectations for "The best preserved medieval town in Europe". I wasn't disappointed, but I rate Talinn (that I visited a few months ago) higher - probably because Belgian towns are so familiar to me. My first stop in town was the Church of Our Lady , with a delicate statue of Mary and her child. It was made by Michelangelo, and it's the only work of his that can be seen outside Italy. Inside (or beneath) this church there are also impressively decorated graves of Burgundian Kings. 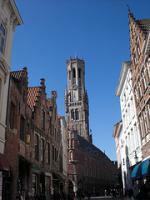 In the center of Bruges, at the large Market Square, the enormous Belfry Tower and Cloth Hall dominates the scene. The Tower just seems to be too high for the building underneath that has to support it. Other interesting places to visit are the Beguinage and the Gruuthuse-museum (in a lovely building, see picture at the left). 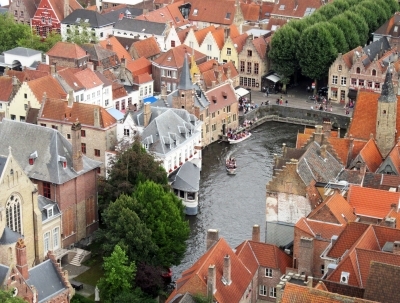 In 2008, we watched the movie In Bruges and were immediately captivated by the charming town. The cast of Colin Farrell, Brendan Gleeson, and Ralph Fiennes didn’t hold a candle to the beautiful buildings and romantic canals in the town. Years later, in 2018, we had the chance to visit Bruges twice: once in summer and once in the winter for Christmas. Bruges is not far from Brussels and can easily be visited as a day-trip from the capital. However, the ambiance of the town is magnified in the early morning and late evening hours when all of the day-trippers have left for the day and you can wander the streets between the Hanseatic buildings by yourself. The incredible medieval town city was everything that we hoped for. We fell in love with the Dutch-Gothic architecture of the beautiful Beguinage cloister, itself a UNESCO World Heritage Site (a UNESCO site within a UNESCO site). In many ways, Bruges is lucky. It was twice captured by the Germans in the World Wars, but both times it escaped destruction – by either the Germans or the Allies. In visiting Bruges, we got a glimpse of what other cities in Europe may have looked like if they had avoided destruction. The best part of Bruges may be the chance to do nothing at all. It is the perfect place to take a canal cruise and sit by the water while enjoying some of that famous Belgian chocolate. Or maybe a Trappist beer while reflecting on one of Europe’s most beautiful cities. Either way, we absolutely loved our visit to Bruges! Brugge is a beautiful city, and one of the highlights of my visit to Belgium in August 2018. The first evening I spent in Brugge, I enjoyed traditional moules-frites with friends at a cafe on the market square, admiring the Gothic architecture with the doubly-inscribed belfry towering overhead. Over the course of two days, we spent memorable hours wandering the city, admiring canals, churches, chocolate shops, and the walls and windmills surrounding the city. We also climbed the belfry for overhead views of the winding streets and waterways. Back at ground level, the beguinage delivered a quiet respite from tourist crowds, and I loved its location on the water. In fact, the canals were perhaps my favorite aspect of the city, providing a backdrop to historical buildings and offering scenic boat tours that crossed under the numerous bridges from which the city gets its name. Along one of the canals we encountered a Sunday market with numerous stalls we enjoyed perusing. I'd been uncertain of how much I would enjoy Brugge after reading Rodenbach's Bruges-la-Morte prior to the trip, but I was pleased to find it as photogenic and welcoming as I had heard from others who have visited the city. 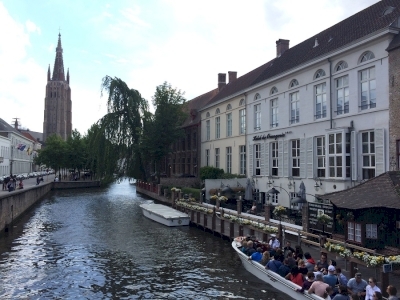 Logistics: Brugge is easily accessible by train or private transport, and the city is quite navigable on foot, though I highly recommend making time for at least one boat tour. My wife and I visited Brugge (Bruges) in August 2017. I'd visited just over 12 years earlier, and little seemed to have changed. It's still very beautiful, still very touristy, and still enchanting. One thing I would definitely recommend is staying in the old town for two nights at least, since a lot of people just see Bruges as a day-trip from Brussels, and it's much more tolerable in the early morning/late evening when the crowds have gone home. In Bruges, there are the churches and the grandiose public buildings. They symbolise the medieval settlement that was once a commercial and cultural capital of Europe. They brought people here from across the world hundreds of years ago and they continue to do so today. But it’s a living city, much more than many of the other famous historic centres of Europe. Houses, apartments, local bars. How can somewhere so famous for tourists still have so many pockets with no strangers on the sidewalks, no visitors in the cafes? It’s the light and the shade of Belgium’s picturesque urban treasure. Together, everything within the eleventh century walls is in its rightful place. The medieval street pattern survives, the canals once used for trade remain, and the influence of the old resident artists permeates throughout. I went to Bruges with university friends in July 2009 (having also visited with family the year before). After a pleasant walk around the cobbled streets and bridges (not forgetting the alcoves) we headed to a bar on the Grote Markt where we would end up spending a lot of time (and money) over the next three days. We tried lots of Belgian beer - some of the better ones were: Bruge Zot, Duval, Kwak, Leffe (Blonde & Brun), Jupiler (of which we took a keg home), Chimay, Stella Artois (it is definitely better in Belgium) and Judas. On our last day we climbed the Belfry, which involves a very narrow spiral staircase which is nauseating to climb - not to mention with a hangover. Brugge is a magical place. Rather than simply find a heritage site surrounded by a city, it feels like the entire city is a heritage site. You are truly transported back in time with swans swimming on canals and eating in restaurants built in the 17th Century. Among the historic towns of Belgium it is undoubtedly the most impressive one, with the main square with its colorful and original buildings. you can get lost in the historic streets, even far away from the channels. Enjoy also some windmill nearby. Brugges, sigh!!... You really do have to take a deep breath when you think or speak about this magical breathtaken, gorgeous medieval city. When you are walking the uneven, very old cobblestone streets, while you listen to horse and carriages go by or the towering churches bells sound, it transports you back in time, and makes you forget for a little all your sorrows. It feels like you need to take a virtual tour instead of your regular pictures, you will need to turn 90 degrees on each picture so you don't miss anything, because everything you see it's a gorgeous little corner picture. You feel, in a christmass town in the middle of August. I think it would be a great honeymoon spot, quaint and romantic with white beautiful swans next to the love lake. One destination not to miss on your wish list!! I've visited Bruges 6-7 times at least and I was never let down. 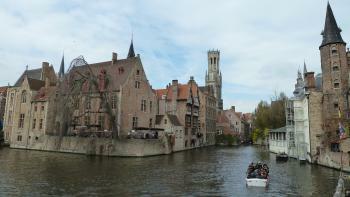 A boat trip through the canals is well worth IMO as it gives you an overall view of Bruges. My favourite visit was in Winter when everything was covered with snow - every photo I took was like a Xmas card! 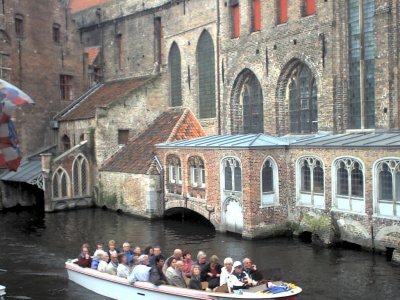 It is worth-visiting Brugge for everybody who wants to enjoy a medieval urban landscape. The historical center is so large that one can find picturesque places without crowds of tourists. Nevertheless, I have some doubts on the medieval authenticity of the site, because I would expect half-timbered houses instead of brick neo-gothic. My husband and I visited Brugge in December 2008. He had recently watched the movie "In Brugge" and suggested we add the city to our European vacation itinerary. I am so pleased that we did. From the very second you enter the historic city centre you are taken back in time, you just feel your very soul relax. Our hotel was a small one located around the corner from one of many cathedrals, well within an easy walk of the town centre. Brugge is in a word "breathtaking". Christmastime was especially lovely - although everything is beautifully lit, nothing is too commercial and nothing detracts from the history of the place. Everyone we spoke with while there were extremely pleasant and helpful. All spoke at least a little English. Not to be missed is a horse and buggy ride through the charming city. Not only is it lovely, but also very informative. Most individuals we've talked to before and since our trip knew very little about this hidden treasure - we encourage anyone visiting Europe to add this special place to your trip - it is well worth it. Growing up I've never been interested in travelling to Europe...until I was sent to Belgium by my former company in 2005 for a Canadian/ EU seminar. If not for that company I wouldn't have had the opportunity to taste and see a part of Europe. After 5 days of being in Brussels, I have decided to explore other cities/ towns and be left behind by my group for another extra day. I went for a day trip (on a tour bus) to Ghent and Brugge ( a co-worker encouraged me to visit these places). I was not disappointed..it was worth the trip. My favourite was Brugge...what an AMAZING place. I was so excited to see castles and to walk in cobblestone streets Being there felt like that the world stood still. The place has it's character-very charming and magical...It's like being in another world. I enjoyed the scenery, the people and the culture. I fell inlove with the place and from someone who's disinterested in Europe in the first place...I am now totally converted. I promised myself that one day I will come back again to continue exploring Belgium and who knows maybe other European countries. Brugge, which I visited in the summer of 2004 is one of the most beautiful Belgian and even European towns. Most buildings are very well preserved and make you feel as if you were in a very rich medieval city. A feeling that's underlined by all the horse carriages in the city. The city is full of tourists, but I think it's a proof that this town is worth more than one visit! I agree that it´s very hard to determine whether Brugge is Europe´s best-preserved medieval city, but it certainly ranks very near the top. The fact that after the city´s Hanseatic League/trading empire heyday, its economic fortunes plummeted was bad news for its people at the time, but a real boon for today´s visitors. The many canals and the chance of a pleasant boat ride give Brugge a Venice-like feel, and the many quiet spots (despite the big number of tourists) really do give the impression of a medieval town. Brugge is today no more one of Europe´s major trading ports (nearby Antwerp has taken over this role, since Brugge isn´t even on the sea anymore), but it still is one of the most interesting tourist destinations - certainly No.1 in Belgium. And for WH collectors - it features a belfry and a béguinage as well. I had heard a lot about Brugge before I went there and was not disappointed in what I saw. There were a lot of other tourists there but if you just go off and find some little back roads and canals and you seem to have the place all to yourself. 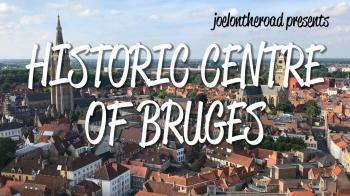 The medieval centre is well preserved and contains some fantastic buildings, including the bizarre looking Belfort (which incidentally is part of another UNESCO site, Belfries of Flanders and Wallonia) but it does offer some of the best views over the city. I was a little disappointed in the main churches, the Onze Lieve Vrouwkerk contains the only sculpture by Michelangelo outside of Italy but this was made a little hard to stomach by the large crowds and piped ambient music that really detracted from the atmosphere. The Heligbloed Basiliek again was filled with tourists and a continues announcement asking for donations which made it feel much more like a tourist trap not a place of pilgrimage! On the plus side the Groeningemuseum was very impressive for its collection of Flemish Primitive works! Also the beginhof is quite nice and yet another separate UNESCO site so that is three for the price of one!! Today I remembered that in a few months it will have been 20 years since I visited Brugge. I arrived there on July 3, 1984 and spent the first night in the youth hostel. It was my first trip to Europe and I had just spent the previous 3 weeks travelling through England and Scotland. On the next day, I went into the delicatessen in the Market Square, which is (was) next to Cafe Cranenburg (sp?) to buy some cheese for my lunch. I was waited on by a tall, raven haired woman with whom I flirted. She was decidedly unimpressed with me, so I took my cheese and left. Later that day, I had just walked out of the post office on the other side of the Market Square when I saw the woman from the deli go past. I went after her and caught up to her as she was looking at a store window display. I began a conversation and within a few minutes, we went to a cafe to have a drink. We hit it off quite well this time and made plans for dinner that evening. Well, to make a very long story short, I spent the next two weeks with her. Everyday that she had to work, she would finish at 2 pm. I would be waiting for her in the Cafe. Then we would spend the day seeing the city. There's really not a whole lot there, as it's quite small, yet I never tired of walking around the lovely canals, admiring the buildings. Every evening we went out to a different restaurant and then we would go to 3-4 bars. I developed a taste for Stella Artois and French wine in those two weeks. On her days off, we visited other cities. The most memorable for me was Ipres. After a few days with her, I was in love and she as well. It was the most intense period of my life. I felt as if I had lived two years of wonderful experiences in such a short time. I acquired an intimate knowledge of the city and I came to love it almost as much as I loved her. After 10 days, I had to leave, as I had to see more of Europe before the summer ended. Leaving her was so difficult, that we both were crying the night before. The next day, she went to work in the morning and left me sleeping, not wanting to wake me for she knew I was leaving. We had said our goodbyes the night before. That day it was raining lightly. I walked to the edge of town and began hitching. It was a good thing it was raining, because I was crying on and off most of the day. When I reached Brussels, I called her at home. Unfortunately, I had written down the wrong number. Dejectedly, I continued on. By 7pm that night, I was in Liege. My pain was so great, that I couldn't stand it any longer and I went to the train station and bought a ticket to Brugge on the very next train. I arrive back in Brugge about 9:30 that night. I went to her apartment but she wasn't there. I went to her mom's house and her car was out front, but there wasn't any answer at the house. So, I left a note on her car telling her that I had returned and was waiting at the Cafe. After sitting there for about 30 minutes, she came walking around the corner with her brother Josef. When she saw me, she broke into a run and said, "I can't believe it. It's a miracle. You've come back to me." After 20 years, I can still see her reaction as her face lit up with joy and she broke into a run almost yelling those words. I can still hear her voice say, "It's a miracle." We went back to her place that night. For four more days I stayed with her. But finally I had to leave, without any doubt this time, as the Tour De France was ending and someone better left unidentified was returning to Brugge. The second time I left the weather was better, a beautiful summer day. Josef had volunteered to give me a ride to Frankfurt, Germany on the back of his 850 Moto Guzzi. Our departure this time wasn't so sorrowful, yet it was just as painful. She stood there on the sidewalk by her mom's house and waved to us as we pulled away. She was so beautiful. I wish...so many things. So here it is, twenty years later. I'm a university professor, sitting in a computer lab letting my students do as they please because I have this incredible need to tell someone this story. It's been twenty years since I fell in love with Hilde, and though I stopped loving her a very long time ago, I've never forgotten her. The periods in which I go without thinking about her have gotten longer over the years, but when I do remember her, the intensity of the memories is still as strong as if it had happened last year. I just had my 46th birthday last week and I'm feeling extremely melancholy today. I wonder what has become of Hilde. I wonder if she's happy, if she's had a decent life. I wonder if she met a man that respected and truly loved her. I wonder if she's a mother. I wonder if she's still alive. I wonder if we would have anything to say to each other now, if we would have anything in common beside the past. I was thinking of going to Brugge this summer. I'm finished with work in June and I could be in Brugge for July 4th. Would I be able to find her? Is it a big assumption to think she's still living in Brugge? I believe it was Thomas Hardy that said that you can never go home again. I've asked myself what is it I want. I'm happily married now, but it's not a sexual desire or one of passion. It's more about finding someone who played a short, but important role in my life and seeing how they are. To say hello, to look her in the eye and tell her that I've thought about her thousands of times over the years. To hold her hand and let her know that our lives were once intertwined and the mark it left was indelible. If I were to live for another 40 years, I doubt it would disappear. I want to know if she feels the same way, if she's thought about me again and again over the years. I want to know if she's aware that it's been twenty years this July. Does she have a small desire, unexpressed, that maybe, beyond all reasonable possibility, that some day we'll meet again. When I think of how simple it is for me at this point in my life to get on plane and be in Belgium, I wonder why I don't. Maybe I will. Maybe this summer, I'll be sitting in the Market Square in Brugge on a beautiful day watching for her. Then I'll see her walking past. I'll hesitate because I won't be sure it's her. But, like the first time, twenty years ago, I'll be bold and run after her and call her name. If it is her and she stops and turns, what will be her reaction when she recognizes me? In 1980 as we walked toward downtown Brugge, we found hundreds of people in costume and medieval dress, and many horses and sheep waiting for a parade to start. Brugge puts on this pageant every five years, and it tells the history of the town in about 90 scenes depicting various incidents. There were dancers, singers, horses, flocks of sheep, and hundreds of people in costumes. It was very interesting, although we learned more than we needed to know about Brugge's history. I enjoyed this city, here I learned to love the spirit of Belgium - yes, to my mind you have it! Don't underestimate this fabulous place. Is it the best preserved medieval town in Europe? I have doubts, but definitely among the best. Numerous channels make it very special. History is quite interesting here - its hard to imagine now, that rather recently sea was right at the city. Up until a year ago, i hadnt done alot of travelling. My now ex boyfriend was fairly well travelled and he was living in the Netherlands. The 1st time he brought me to NL, we stopped off in Brugge for the nite and spent the following day there. I have never fallen in love with a place so easily and deeply before. 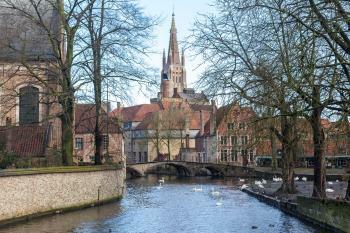 Brugge is one of the most beautiful places on earth and i cant wait to finish my photography course, leave England and get back there next summer. What a place, fabulous people, architecture, food. Everything about Brugge is amazing. Historical Financial Institutions: House of the Van der Burse family: in the late 13th century commodity traders in Bruges gathered inside the house of a man called Van der Burse, and in 1309 they institutionalized this until now informal meeting and became the "Bruges Bourse". The idea spread quickly around Flanders and neighbouring counties. 557 Community Members have visited.